The built-in localization mechanism in Silverlight and WPF allows you to localize any string resource used by the standard RadScheduleView control. Once translated you might use your resources in Silverlight and WPF projects without changing anything. The Telerik.Windows.Controls.LocalizationManager allows you to easily localize any of the Telerik controls. To apply custom localization to your controls just instantiate your custom LocalizationManager and set it to the static property LocalizationManager.Manager, before the creation of the UI. Note that you have to set the localization manager before the creation of the UI, otherwise some parts might remain not-localized. 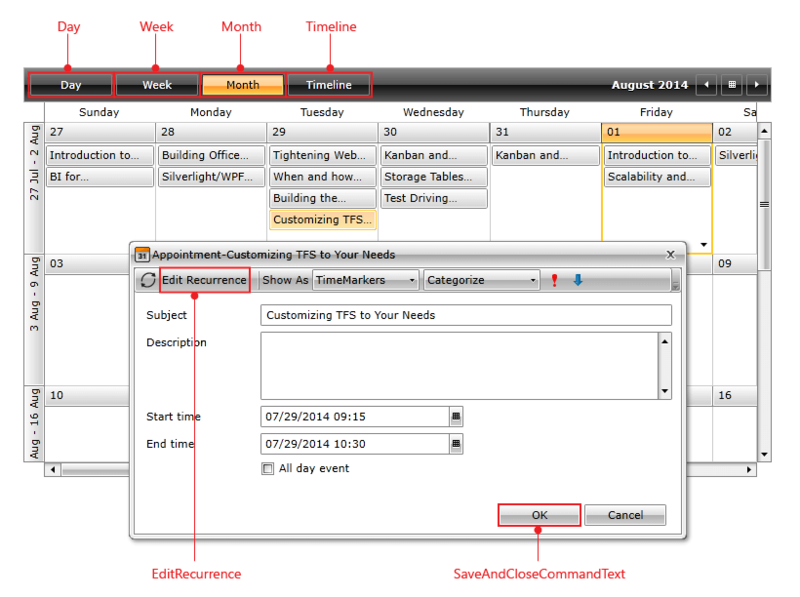 RadScheduleView is a complex user interface control and its strings for localization are numerous. In order to be able to distinguish these resources, a unique identifier, called resource key, is assigned to each localizable string. On the picture below you can see some of the resource keys and the strings they are associated with. A complete list of the RadScheduleView resource keys can be found here. You can base your localization on the standard resource files provided by the .NET framework. For that purpose you will have to create a separate .ResX file for each one of the languages that your application will support. ScheduleViewResources.resx - this resource file will store the English(default) resources for the ScheduleView control. Set the AccessModifier property to Public. ScheduleViewResources.de.resx - this resource file will store the German resources for the ScheduleView control. Set the AccessModifier property to No code generation. ScheduleViewResources.nl.resx - this resource file will store the Dutch resources for the ScheduleView control. Set the AccessModifier property to No code generation. Now, having the needed files, it's time to illustrate the idea and localize for example the text for the Day, Week, Month and Timeline navigation strings. For that purpose you need to create four resource strings in each one of the three resource files and translate them to the appropriate language. Note that the name of the resource string should be the same as the resource key for the string you are localizing i.e. the resource key for the Day is Day, for the Week is Week, for Month is Month and for the Timeline is Timeline. 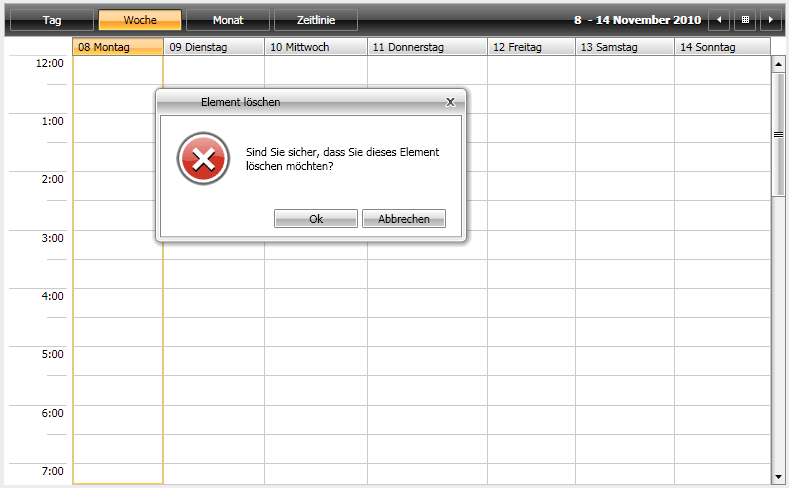 The snapshot below shows the content of the ScheduleViewResources.de.resx file. The resource name of the other two files should be the same. The Value column will contain the translation for the appropriate language. RadScheduleView provides you with built-in resources for several cultures: Spanish, German, Italian, Turkish, Dutch. To change the default culture, you should set the CurrentCulture and the CurrentUICulture of the CurrentThread. Note that this must happen in the code-behind of your Application (App.xaml.cs) file, right before the UI initialization. The next code-snippet shows you how to change the CurrentCulture to Dutch.